Questions: "I have a few teams (marketing, product and customer success) all working in Appcues. I'm curious how many flows one of our users is eligible for on the home page, how can I find out?" "I've just published a flow, but it's not showing, how can I figure out why?" Answer: The Flow Diagnostics page, aka the "Flow Doctor." 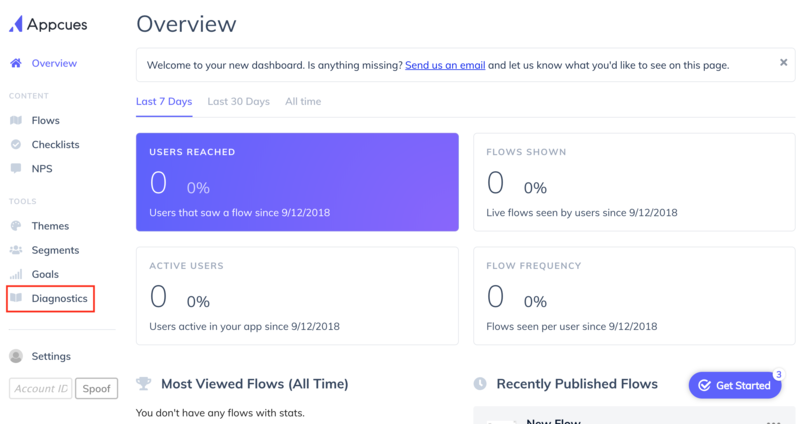 Our Flow Doctor is the easiest way to understand why your flow isn't showing to the intended user(s). Let's learn how to use the tool! If you've already opened your debugger you can click on the blue 'View Eligibility for User' icon to open the Flow Doctor. From the Diagnostics page, we can start to understand why a certain guest is or isn't eligible for a specific flow. If you accessed this page from the dashboard you'll need to enter in some user criteria first. Click the "Select Page/User" icon and enter either a User ID (this is your company's way of internally identifying your users, not your Appcues user ID) and a URL to identify the eligible flows. 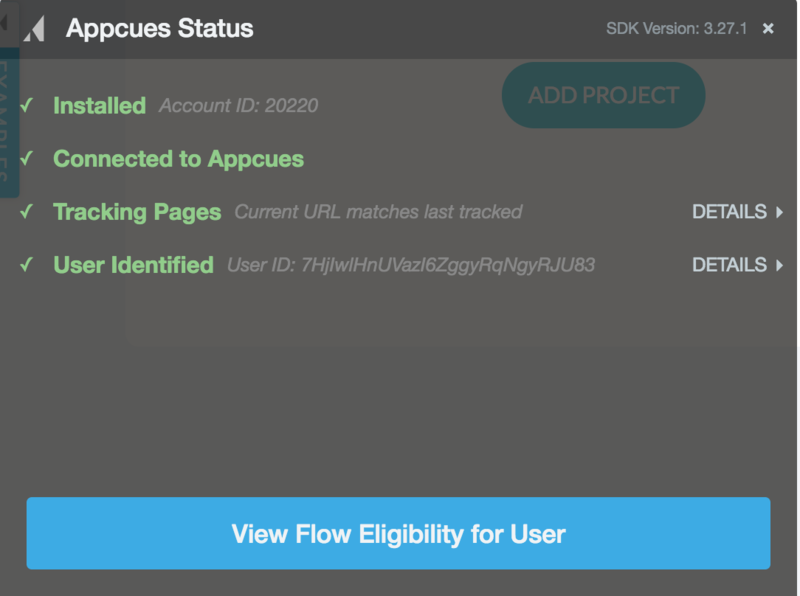 If you click on a non-eligible flow, it will show you the reason the user did not qualify. 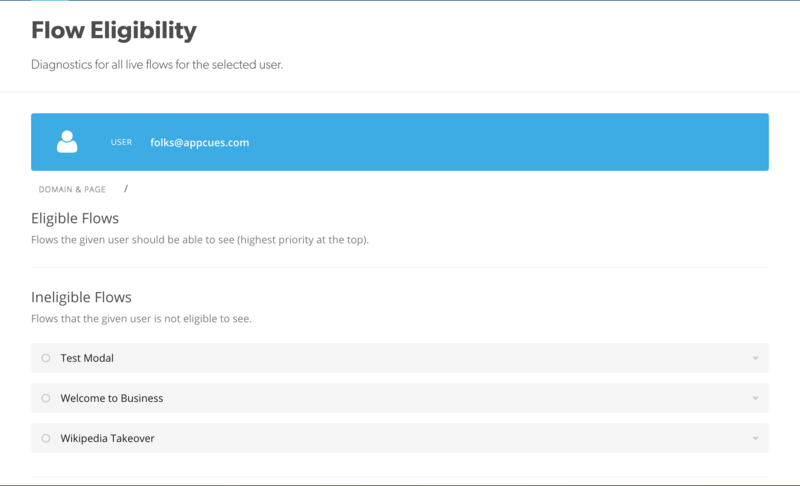 For example, for the flow shown below, the user is not qualified to see the Test Modal because they've seen it before, and they also do not currently match the audience targeting rules. Select the arrow next to the criteria to get a deeper understanding for why the person did/didn't qualify. If you've reached this page from the Debugger you will already see a list of all live flows that your user is eligible to see on the URL where you were, along with those flows that are live but that your user isn't currently qualified to see . You can change the user and URL by selecting the 'Change Page/User' icon. If you've reached this point as a new Appcues customer, or a current Appcues customer testing on a new product/site - and you're still stuck, you may want to check your installation. If you've already done so, please reach out to support@appcues and we'd be happy to assist!